This outfit came to me just before I went to sleep last night. I bought this cardigan pretty impulsively when my parents came to visit and was pretty sure I'd never find anything to go with it that wouldn't make it look super-tacky and valentines-y but I actually like it with the lace dress and red socks. I'm kinda obsessed with these shoes at the moment. They're the perfect shoe for with fun ankle socks!! Today was almost a very bad photo day. It was raining outside so I decided to try taking photos in my apartment. I also tried using my flash but I still don't understand it (luckily, my boyfriend's brother is coming up on Wednesday and he has the same flash as me so he's going to teach me to use it!). So I resigned to going downstairs where I took one helluva lot of really, really bad pictures. I got all grumpy and sulky and was going to give up and then I thought, no, wait, I have a choice. I can give up and go back and sulk and curse my thighs, or I can keep trying. So I did. And they came out okay in the end. I had my first final today. I think it went okay- I knew everything I just hope I articulated it well enough!! I found out I got an A on the paper for that class though so I'm at an A overall at the moment, so fingers crossed!! Just one more final now, an evaluation for my journalism class and the final draft of my independent study and I'm done! I also started packing yesterday (stupidly, everything I'm going to want to wear for the next month, and week. Getting this dress out was a nightmare!!) and I got a lot more in my case than I expected so I'm a little less worried about shipping everything home now. Erick is coming over to help me pack some stuff later and assures me we'll get everything sorted. Two more days of studying and then I can chill out, have fun with my friends and boyfriend and look forward to Chicago and San Francisco. I'm really, really sad to be moving out of my apartment, away from UMD and away from Duluth (for now), but I have another month here to enjoy. All good things come to an end, right? Hope your Monday is less rainy than mine!! edit: OH EM GEE!! I just found out I'm the Best Dressed Reader on the Teen Vogue website!! EEEE!! I remember seeing that cardigan and wanting to buy it, but not having money at the time! Gah! I wish I had now, because it looks SO CUTE on you. :]] I love those shoes with socks, by the way. Very cute. Oh I love that picture of your feet up on the table - with the focus on the shoes! So cute! And congrats on the Best Dressed Reader! You so deserve it. I think the photos came out very cute! That cardigan looks perfect with the lace dress. Great necklace too! Lovely outfit! :) And congratulations on finishing your first final and being Best Dressed Reader!! You deserve it! congrats on the teen vogue feature, well deserved. another lovely outfit with those shoes i lust after, that cardigan is gorgeous and sweet esp with lace. 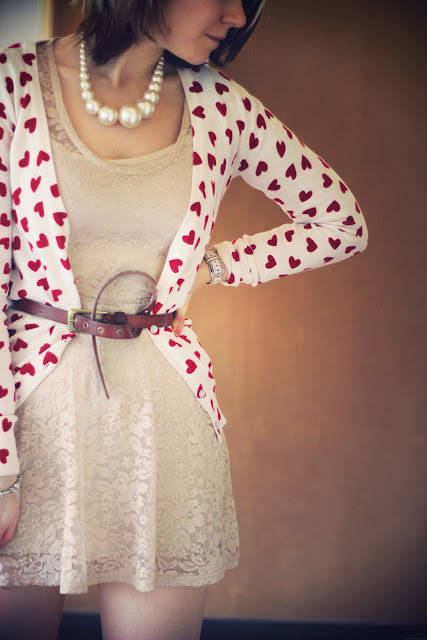 Looove this outfit, the lace dress is perfect with the heart cardigan and not in a valentine-y way at all! Congrats on the vogue feature, thats amazing!!! You look adorable here; I'm glad that you didn't give up on documenting this outfit. The lace and hearts are simultaneously romantic and quirky. Really lovely! Love that little lace dress! You're going through some major changes in your life... I allllmost kind of envy you hah. Remember these times well though, you'll be able to learn from them and rely on those lessons later in life! Charlotte you look so stunning!! I've always loved that lace dress on you, I can't believe you got it on eBay too, I can never find ones like that on there! And those socks and the cardigan, just so cute!! Got to be one of my fave outfits of yours!! And thank you so much on your comment about my thighs haha!! One of my friends actually used to say she liked my thighs all the time so don't worry, I don't find it that weird haha!! But your legs are awesome too, especially in these shoes, so jealous!! Oh and congrats on the Teen Vogue thing, yay!! Well I'm glad you stuck to your plan and took the pictures so you could show us this outfit. You totally broke out of the V-day look. Your cardigan is so absolutely beautiful with your lace dress!